When your Check Engine light turns on, find out immediately if you should stop or keep driving with the Actron PocketScan Plus OBD-II Code Reader with Urgency Indicator. There are many reasons that can cause this indicator to appear -- from minor to critical -- but the PocketScan Plus is here to provide you with the code information you need as well as an immediate recommendation on the urgency of the Check Engine Light problem. PocketScan Plus gives you the information you need. The Check Engine Light appears on the dashboards of all late-model vehicles to signal that there is a possible mechanical or electrical problem that needs to be addressed. The compact and easy-to-use PocketScan Plus attaches to the automobile's OBD-II port, displaying the error code involved on its large, backlit display. Three severity levels tell you at a glance if it safe to continue driving or if immediate repair is needed. The PocketScan Plus also puts you in touch with the emissions status of vehicles and allows you to easily review and erase codes from the automobile. PocketScan Plus makes connectivity easy. According to a nationwide phone survey, over 20% of all vehicles newer than 12 years old have experienced a Check Engine Light appearance in the past 12 months. That's 32 million automobiles on the road every year that are signaling for a potentially costly repair. Your time and money are valuable, and the information provided by the PocketScan Plus can save you both by telling you if the Check Engine Light is appearing for a critical reason, or for a less important one. The PocketScan Plus gives you the information you need before you visit your auto technician. Not only does it provide you with the code for the Check Engine Light, but you also receive access to an online information database that further explains the problem, its severity, possible symptoms, and common causes--all in easy-to-understand terms. Being empowered with this wealth of knowledge enables you to visit your auto technician with confidence. 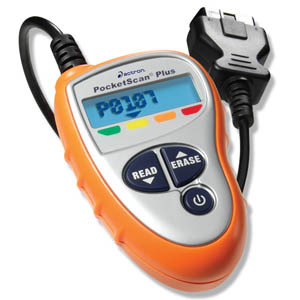 The PocketScan Plus is compatible with all 1996 and newer vehicles. Once connected, it automatically links to the vehicle computer, displaying both Check Engine Light error codes and severity on its large backlit display. Issue severity is color coded for easy reference: green for no problems present, yellow for non-dangerous issues, orange meaning repair at your earliest convenience, and red for a problem that needs immediate repair. Three large buttons allow you to turn the unit on and off, read current codes, and review and erase past codes from the vehicle's onboard computer. A convenient battery backup saves information in the system, allowing you to continue reviewing codes away from the vehicle. Actron makes certain that you will always have the information you need when your Check Engine Light appears. Their online database is available 24 hours a day to explain codes as well as their causes, severity, and symptoms. You can also contact their toll free phone number for additional assistance. Furthermore, the PocketScan Plus has a USB port that allows it to be updated from your computer, ensuring that you will always have correct, current information to diagnose the vehicles of today as well as those of the future. The Actron PocketScan Plus diagnostic tool reads and displays diagnostic trouble codes - it provides the reason the check engine light is on. U.S.A.
Good item for the occasional usage that the CEL turns on. It will cost you about as much as one of these to have someone read the codes. The only minus if you want to call it a minus, is you have to look up the codes to figure out what they mean. Very easy to use OBDI scanner! If you get the dreaded CEL and need to know what is causing it to illuminate, this is the tool for you. 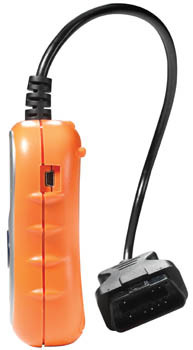 Designed for the home mechanic, it is complete with easy to use interface and large display. (great when you don't have your glasses on). I had a code in it that did not show up in their online database. I found it though, searching the internet for more Honda codes. Once you get the code, you have the option of clearing the MIL, which turns off the Light. Only shut off the CEL once you have solved the problem. The tool also gives you all of the Readiness Monitors status. So, you can tell when it is OK to go for the emissions test. I purchased this little gem when my check engine light came on. I got 2 codes, which after confirming with regular "shop" equipment, found the codes to be accurate. I recently purchased the CP9410 because of its low cost and claimed ability to work with all OBD2 vehicles, including those with the newer CAN protocol. While it works fine with two pre-CAN Mazda vehicles, it failed to work with my wife's 2009 Hyundai Sonata which is CAN based. It keeps displaying a Link Error because it can't communicate with the vehicle's engine computer. Actron's technical support asked me to go to Autozone to see if their scanner could read my wife's car. The local Autozone used an Actron CP9175 and it worked fine. Actron's tech support forwarded my problem to engineering to develop a new software release to correct this problem. Since this will take some time to develop, they offered to send me a CP9175 at no charge since we know it works with the 2009 Hyundai. Very good for diagnosis of problems at a reasonable price. Was able to check codes on our 2001 Infinity QX4 and erase minor fault codes. Battery allows code retention for future lookup. I am a complete novice with OBD tools. I have never used one before. I have an old truck that's check engine light came on some months ago. A mechanic turned it off for me and it did not come back on again until recently. I needed a tool to find out if I had a real problem or an anomaly, so I bought this tool. The owner's manual directions that come with it are explicit and clear, thus making the tool extremely user friendly. Within a matter of moments I had the troubles diagnosed and then, seeing that they were the same codes as before, I turned the check engine light off again myself. The tool does that as well, which is wonderful. The tool's display is back lit so it is easy to read the codes in a dimly lit environment such as a gagage. NOTE However. I had difficulty disconnecting the tool from the truck. I figured there was some sort of mechanical snap lock holding it on, but I could not find it. I had to call the 1-800 help line number they have in the users manual to find out how to disconnect it. It turns out that ALL OBD II connectors are, by law, a friction fit and there is no snap lock holding it on. All one must do is hold the vehicle's part of the connection and wiggle and pull the tool's connector part off. This information is not the owner's manual. This is one awesome gadget! Used it to decode my 03 Silverado which came up bad glow plug. I did have to go online to find the code but also found the GM had extended the warranty on glow plugs to 10 years and 200,000 miles. I had 104,000 so I originally thought I would have to pay. Paid for itself first time out.